The Site Admin was invited to the media release of the Contract 951 Downtown Line Singapore on 9th November 2012 as a member of the Friends-of-LTA. The media release was held at SMRT Kim Chuan Depot, where the train was delivered to. 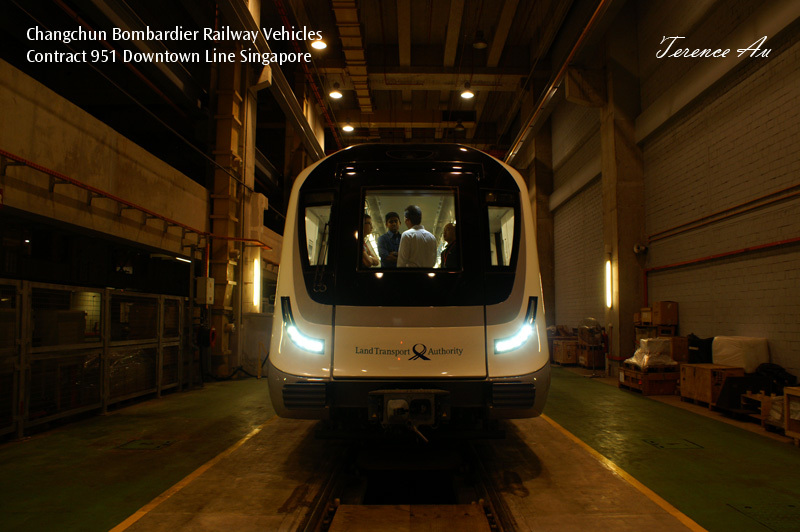 Land Transport Authority Contract 951, valued 571 million Singapore Dollars, was awarded to Bombardier Transportation in November 2008 for 219 passenger railway vehicles from their proven Movia line. The Movia was designed by Adtranz, which was acquired by Bombardier in 2001. The Contract 951 trains are manufactured by the Changchun Bombardier Railway Vehicles Co., Ltd, a joint-venture between Bombardier Transportation and China CNR Corporation, Changchun Railway Vehicles Company Ltd/长春轨道客车. 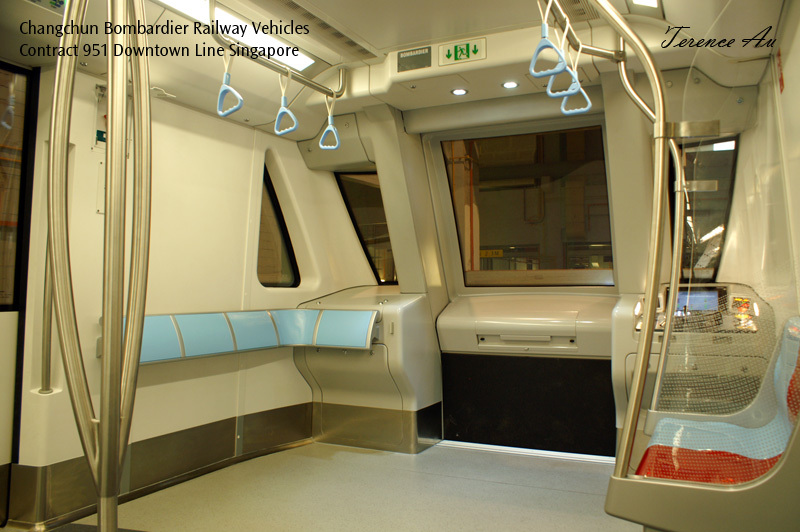 Each Movia for service on the Downtown Line will be three-car long, featuring driving motor cars on the ends and a trailer car in the middle, MT Ratio of 2M1T. There will be a total of 73 three-car trains operating on the 42-kilometer long, 34 stations system. The Movia 3-car train weights 115 tons, 8.5 tons lighter than the Circle Line Alstom Metropolis stocks. This is due to a higher material composite of aluminum, which make up 90% of the train, and usage of medium frequency converters. At the end of its projected lifespan, most of the train can be recycled, an economic consideration. The headlight of the stock utilizes Light Emitting Diode (LED), a first for front headlamps. 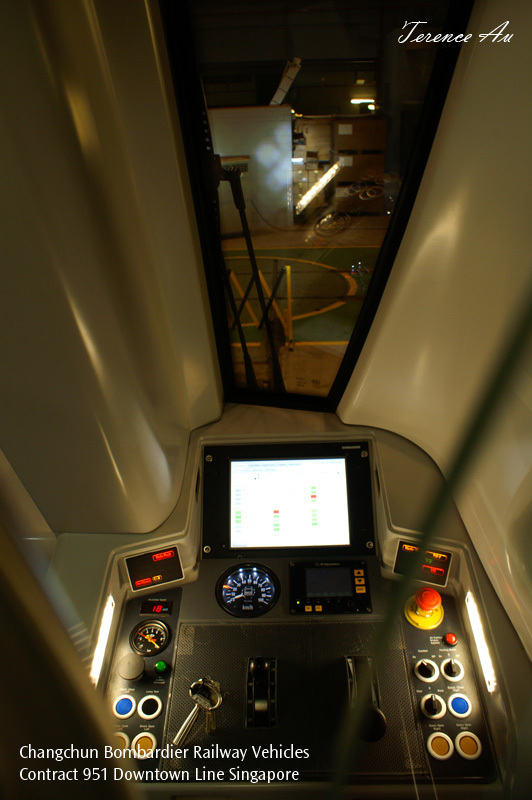 One would notice the futuristic control panel when the train is manually operated. 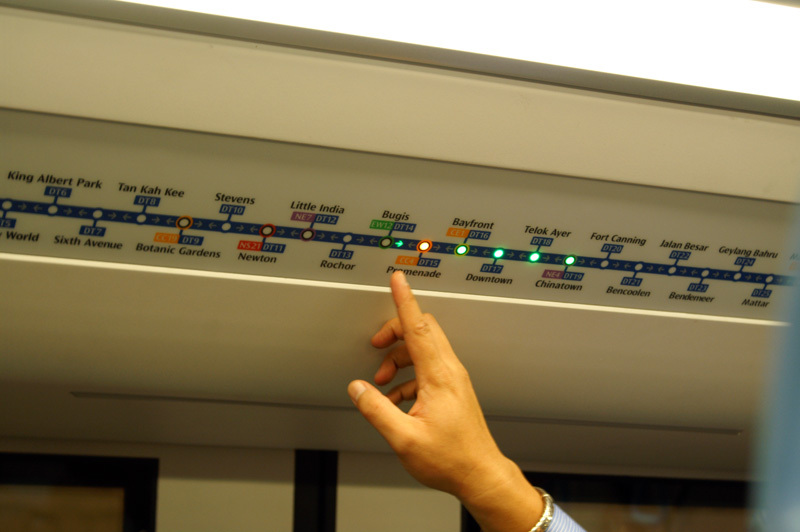 During normal service hours however, the Downtown Line trains are fully automated, and this panel will be concealed. 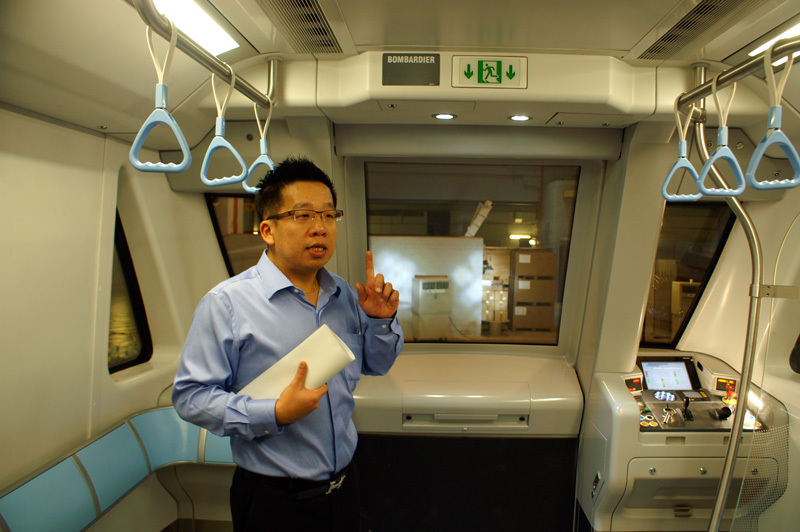 Mr Chia Choon Poh, Senior Project Manager for Rolling Stock and Depot Services (CCL & DTL) giving the members of the press a brief description of the train. The emergency ramp behind him has a new feature too. When activated by a passenger, video images captured of the area will be sent to the Operations Control Centre, where staff will communicate with the passenger concerned about the reason for activation. If the situation is deemed to be safe, the train will carry on its journey to the next station for passenger disembarkation (de-train to platform). If the situation is a genuine emergency, the 3rd rail power supply will be cut, the ramp deployed and passengers can evacuate to the nearest exit/station. The Dynamic Route Map above each passenger door. Two arrows between stations on the board shows the direction of travel of the train. Another new feature on the train are perch seats. Designed for two persons, each ‘seat’ has a golf-ball like texture to increase grip while a passenger is leaning on it. This yields an additional 15% passenger capacity. The Site Admin must be frank that these seats don’t encourage long-distance traveling, but for a few stops is reasonably comfortable. The Site Admin particularly favors the new perch seats installed at the front of the train. The passenger doors. 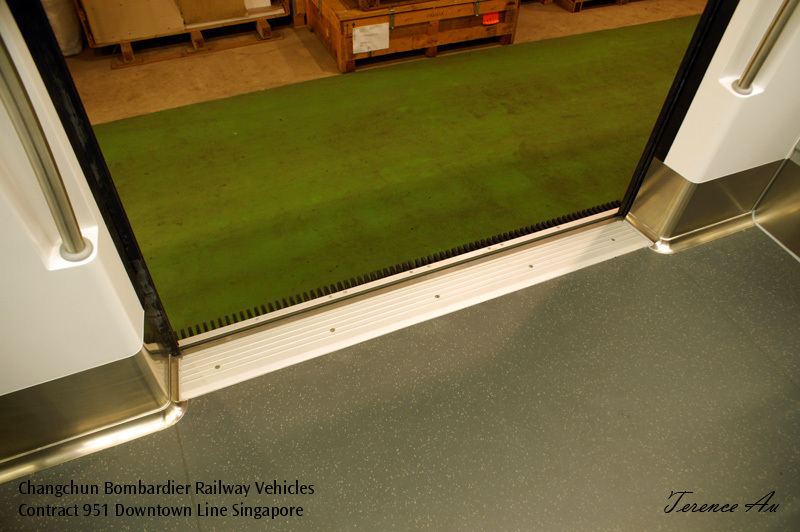 Each door aperture is 1400 mm wide and departing from conventional stock design for Singapore, the doors are flat surfaced. 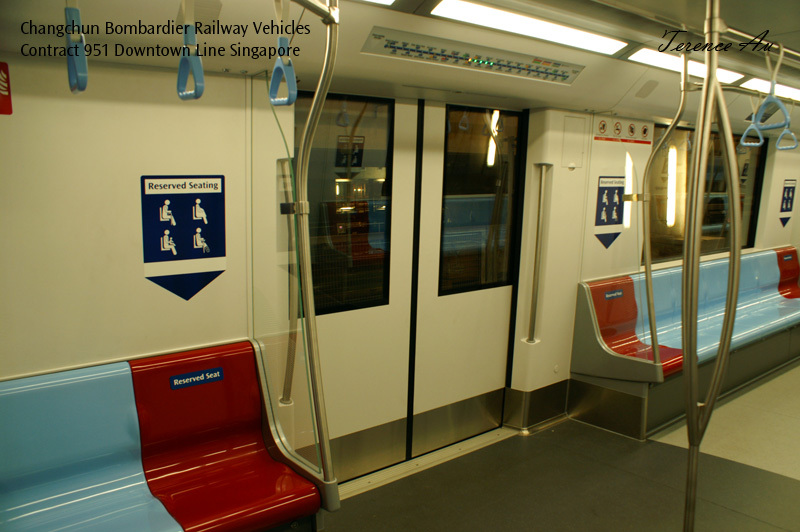 The inter-car gangway area. A place where commuters like to congregate (other than the door area), three bright LED illuminate this area from each car, enhancing safety and security. As you would have noticed from previous photos, the Reserved Seats have a special hue. Yes, all Reserved Seats (Priority Seats) have been colored red, to differentiate these seats catered for commuters with special needs. 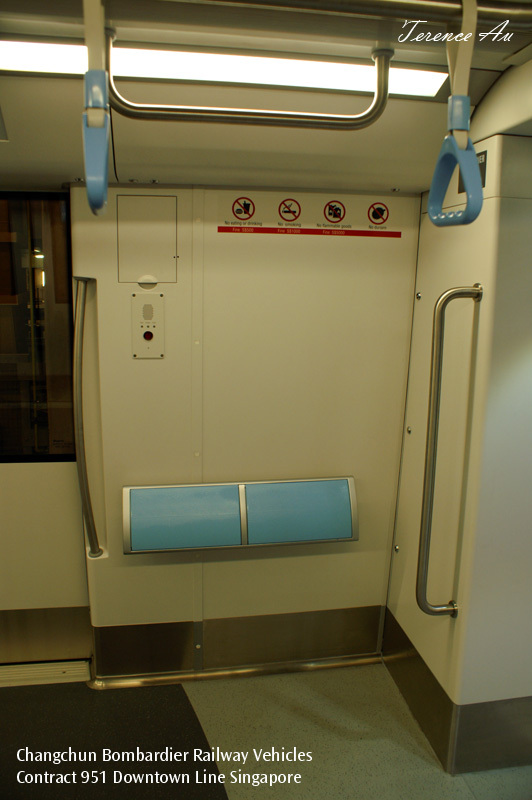 Seen from inside the train, the frangible gap at doors to reduce the platform-train gap from 75 mm to 40 mm. A demonstration of the emergency mode, with reduced lighting and ventilation run directly from batteries. 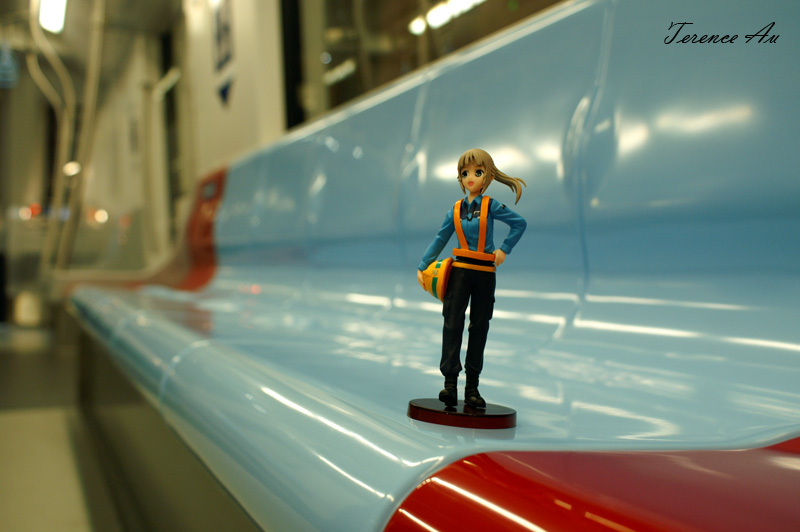 Each passenger car has a themed color for the seats. Starting from the first car 90031, the seats are colored yellow, second, and middle car 90032 is green, and the last car 90033 is blue. Pastel colors are used to bring a soothing effect to commuters. The seats too feature ergonomic curves and a ‘bump’ in the middle to reduce cases of embarrassment between seated passengers. 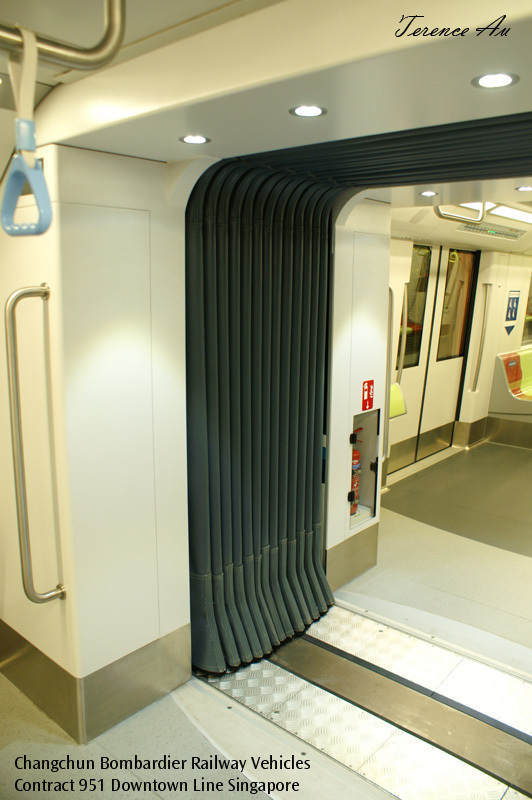 As you can notice, the train has three rows of handgrips, succeeding the Contract 151A stocks from CSR Qingdao Sifang as the next stock to be installed with more handgrips to provide more support for standing commuters. 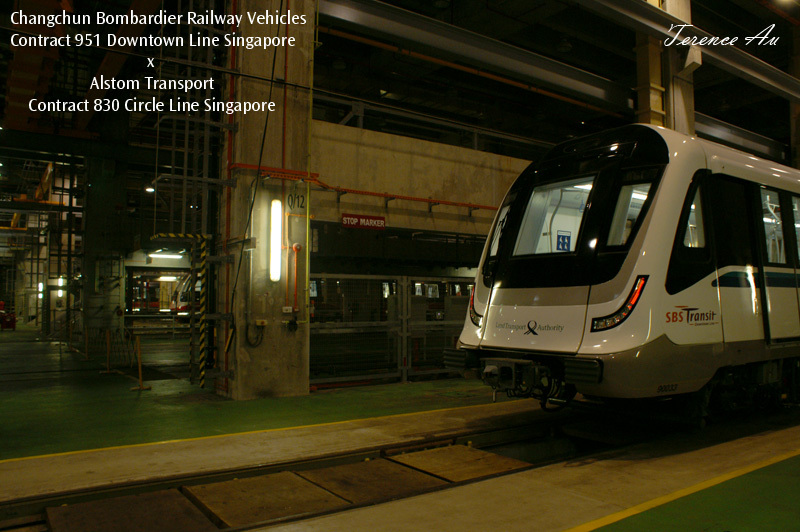 Today, the Movia parks side-by-side with its Circle Line counterparts, the Alstom Metropolis. 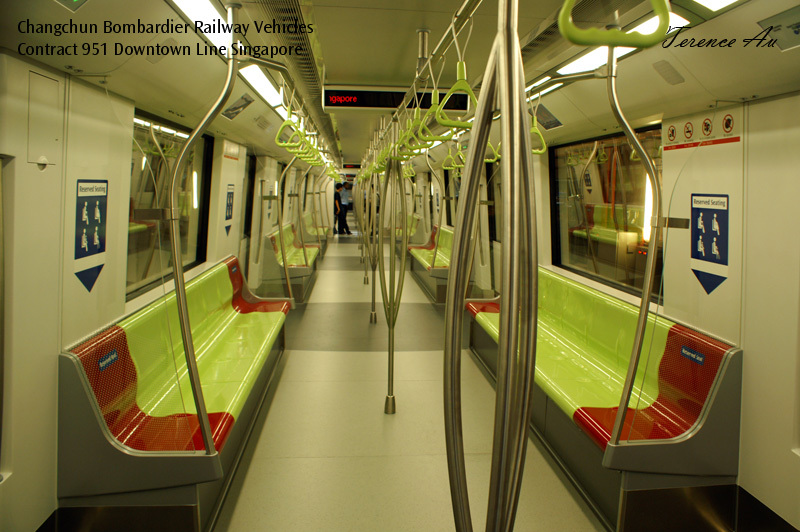 Come 2015, the Downtown Line trains will be housed in Gali Batu Depot located in Northwest Singapore. The usual お負け/’extra’ that the Site Admin would love to share with you, my readers. 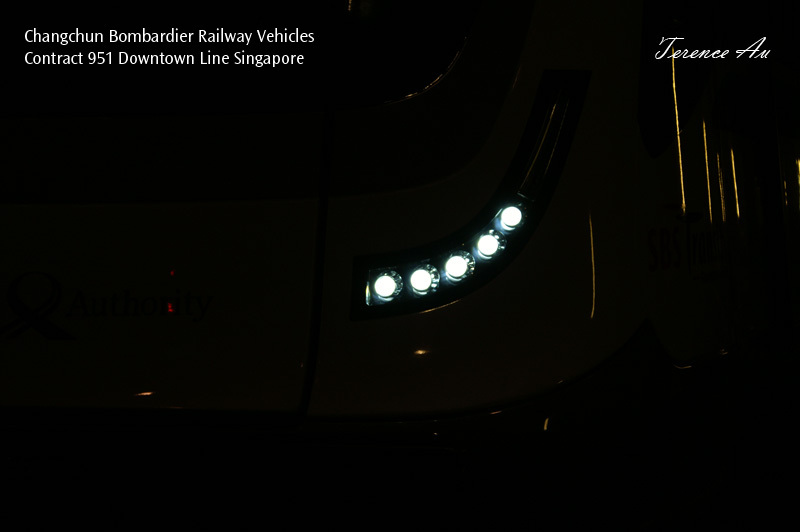 The following is a simple technical specification of the Bombardier Movia stock gathered from overseas examples as well as official Bombardier website. This does not apply as the official specification for the Contract 951 and is not endorsed by the Land Transport Authority. The FLEXX 2000 is proven by systems in Ankara, Athens, Bucharest, Guangzhou and Toronto, to name a few. 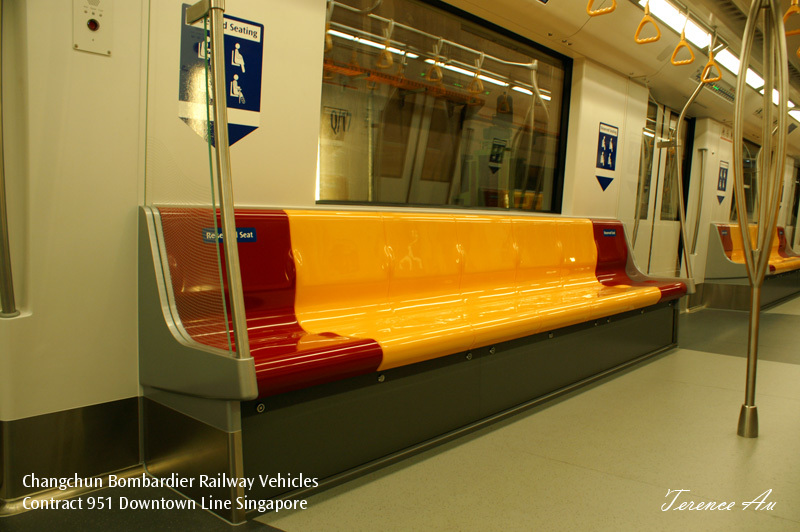 Contract 951 is the second model of rolling stock supplied to Singapore manufactured by an overseas corporation with China rolling stock manufacturer, the first being the Contract 151A running on NSEWL today. With the China rolling stock market taking off after the influx of foreign investments following the High-Speed Rail (HSR) projects, no doubt future rolling stocks will pass by China as a manufacturer or equipment origin before delivering to customers. The use of Medium Frequency Converters (known in the market as Medium Frequency Transformers/MFT) is generally popular to the Europeans who have line voltages in 15, 16 2/3 or 25 kV Alternating Current (AC). The MFT eliminates the need of a low frequency transformer (LFT) which is heavier than the MFT circuit. This leads to a reduction of weight and energy consumption. The MFT would be a plus-point when applied onto DC traction, for all motors now are standardized to AC traction. ADTranz, the predecessor of Bombardier Transportation, has experience in MFTs since the late 90s. The lighter train contributed by 90% aluminum structure may just be the trend of future underground stocks for Singapore. Even for overground systems, there are no at-grade crossings in the revenue sections, hence eliminating the possibility of grade-crossing accidents. Crash-protection can hence be simplified, not removed however, to achieve a lightweight carbody structure. Combined with advanced signaling system, our trains can just get lighter as technology improves. Lighter vehicles reduces energy consumption, an important factor in a small city-state like Singapore. 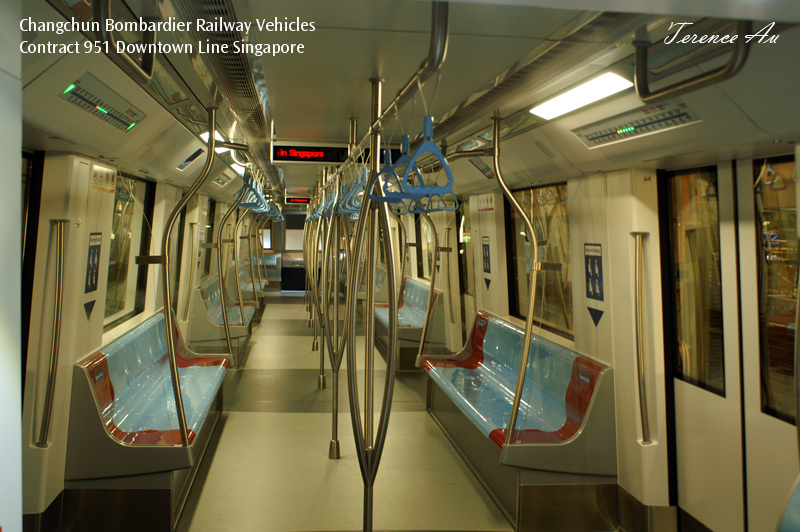 Bombardier Transportation is proven in the market for high speed rail, rapid transit and automated guideway transit (AGT) systems. 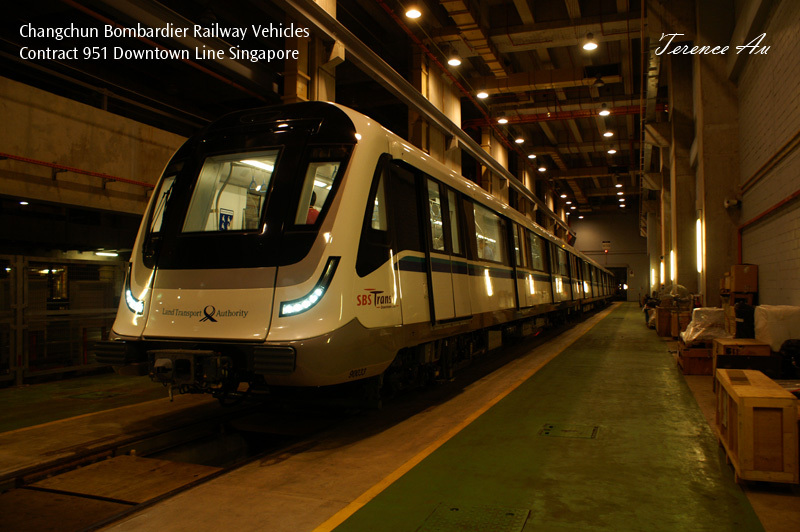 Contract 951 is their first passenger rolling stock supplied to Singapore, following the AGT vehicles by ADTranz (ABB Daimler Benz Transportation) for the Changi Airport Skytrain and Bukit Panjang Light Rail Transit (LRT). Changchun Railway Vehicles Co. Ltd was established in 1954 as a rolling stock manufacturer in China, starting operations in 1959. The establishment manufactures railway locomotives and passenger cars for Ministry of Railways. In June 1998, it formed the first partnership with ADTranz, the Changchun Adtranz Railway Vehicles Co. Ltd., thereafter in 2001 when Bombardier bought over ADTranz, renamed to the present Changchun Bombardier Railway Vehicles Co. Ltd. The Changchun-Bombardier partnership has seen productions of rapid transit vehicles for China major cities, and in recent years, CRH high speed rail vehicles. The CRH1, 5, 380B and C models are some of their products for the HSR market in China, with technology transfer from Bombardier. The Site Admin would like to thank officers from Land Transport Authority for the invitation, Mr Chia for the explanation of the technical aspects of the train, Mr Chan Tsung Yi from SBS Transit Corporate Communications for the explanation of commuter-friendly features on the train as well as staff from Bombardier Transport Singapore for facilitating the visit.